Americans are living longer and more fulfilling lives. They desire to live as independently as possible. But independent lifestyles come with risks, such as debilitating falls and deteriorating health resulting from inadequate care. To address these issues, researchers are developing “smart home” technologies to enhance residents’ safety and monitor health conditions using sensors and other devices. In particular, the continuous assessment of physical function is a key indicator of initial decline in health and functional ability. Identifying and assessing problems while they are still small can provide a window of opportunity for interventions that will alleviate the problem areas before they become catastrophic. To collect video data of staged scenarios in realistic multi-person settings using older adult participants, thereby producing a body of labeled data. To utilize the collected labeled data, develop and evaluate algorithms for analyzing video in a way that preserves privacy, extracts the pose sequences of multiple persons, tracks the movement of inanimate objects, and generates assessments and summarizations of the observed activities and physical function. To evaluate the effectiveness of the summarization and assessments by showing the video and extracted information to gerontology experts and obtaining feedback. To assess the perceptions and attitudes of older adults towards video monitoring by showing them the processed (“anonymized”) video and extracted information. Figure 1. Silhouettes are extracted from two orthogonal views and used to create a 3D voxel representation. 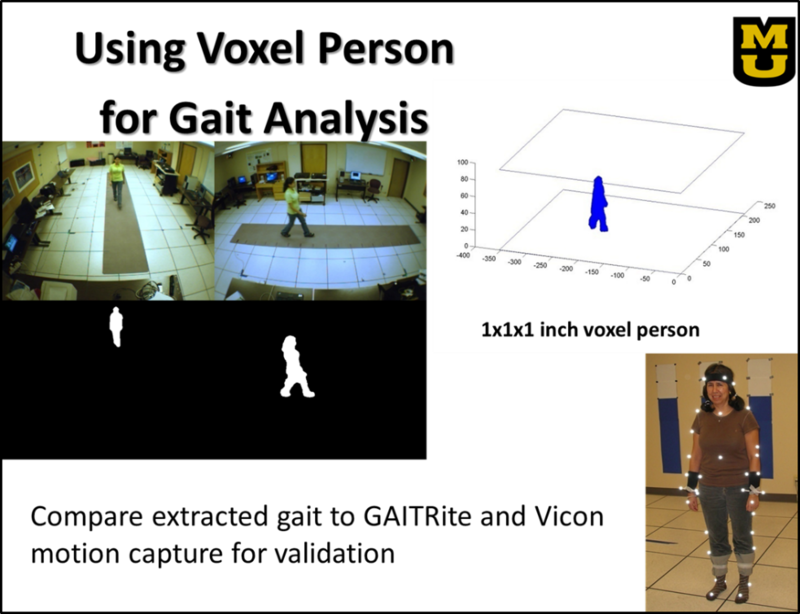 Algorithms developed with “voxel person” have been validated in the lab with a Vicon marker-based motion capture system. Figure 2. 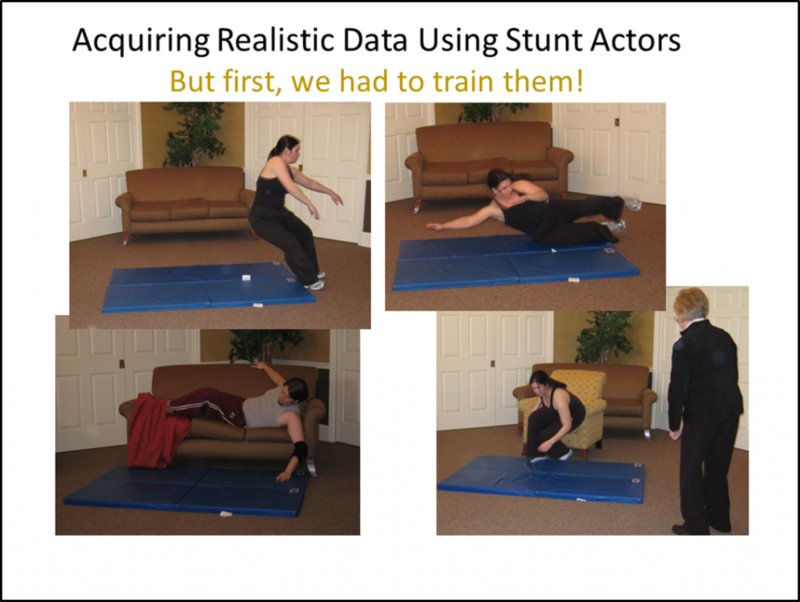 Stunt actors were trained to fall like older adults in 21 different types of falls. Stone EE & Skubic M, “Silhouette Classification Using Pixel and Voxel Features for Improved Elder Monitoring in Dynamic Environments,” Proceedings, 2011 IEEE International Conference on Pervasive Computing and Communications Workshops (PERCOM Workshops), Seattle, WA, March 21-25, 2011, pp 655-661. Zhou Z, Stone E, Skubic M, Keller JM & He Z, “Nighttime In-Home Activity Monitoring For Elder-care,” Proceedings, 33rd Annual International Conference of the IEEE Engineering in Medicine and Biology Society, Boston, MA, August 30-September 3, 2011, pp 5299-5302. Anderson DT, Luke RH & Keller JM, “Segmentation and Linguistic Summarization of Voxel Environments using Stereo Vision and Genetic Algorithims,” Proceedings, IEEE International Conference on Fuzzy Systems (FUZZ-IEEE) at the World Conference on Computational Intelligence (WCCI), Barcelona, Spain, July 18-23, 2010, pp 1-8. Banerjee T, Keller JM, Skubic M & Abbott CC, “Sit-To-Stand Detection Using Fuzzy Clustering Techniques,” Proceedings, IEEE World Congress on Computational Intelligence, Barcelona, Spain, July 18-23, 2010, pp 1-8. Stone E, Anderson D, Skubic M & Keller J, “Extracting Footfalls from Voxel Data,” Proceedings, 32nd Annual International Conference of the IEEE Engineering in Medicine and Biology Society, Buenos Aires, Argentina, August 31-September 4, 2010, pp 1119-1122. Stone E, Anderson D, Skubic M & Keller J, “Footfall Extraction and Visualization from Voxel Data,” Proceedings, International Society for Gerontechnology 7th World Confreence, Vancouver, Canada, May 27-30, 2010. Wang F, Skubic M, Abbott C & Keller J, “Body Sway Measurement for Fall Risk Assessment Using Inexpensive Webcams,” Proceedings, 32nd Annual International Conference of the IEEE Engineering in Medicine and Biology Society, Buenos Aires, Argentina, August 31-September 4, 2010, pp 2225-2229. Anderson D, Luke RH, Keller JM, Skubic M, Rantz M and Aud M, “Modeling Human Activity from Voxel Person Using Fuzzy Logic,” IEEE Transactions on Fuzzy Systems, vol. 17, no. 1, 2009, pp. 39-49. Demiris G, Parker Oliver D, Giger J, Skubic M, Rantz M, “Older Adults’ Privacy Considerations for Vision Based Recognition Methods of Eldercare Applications,” Technology and Health Care 2009;17(1):41-48. Liang J, Abbott CC, Skubic M & Keller J, “Investigation of Gait Features for Stability and Risk Identification in Elders,” Proceedings, 31st Annual Inational Conference of the IEEE Engineering in Medicine and Biology Society, Minneapolis, Minnesota, September 2-6, 2009, pp 6139-6142. Wang F, Stone E, Dai W, Banerjee T, Giger J, Krampe J, Rantz M & Skubic M, “Testing an In-Home Gait Assessment Tool for Older Adults,” Proceedings, 31st Annual International Conference of the IEEE Engineering in Medicine and Biology Society, Minneapolis, Minnesota, September 2-6, 2009, pp 6147-6150. Wang F, Stone E, Dai W, Skubic M & Keller J, “Gait Analysis and Validation Using Voxel Data,” Proceedings, 31st Annual International Conference of the IEEE Engineering in Medicine and Biology Society, Minneapolis, Minnesota, September 2-6, 2009, pp 6127-6130. Zhou Z, Dai W, Eggert J, Giger JT, Keller J, Rantz M & He Z, “A Real-time System for In-home Activity Monitoring of Elders,” Proceedings, 31st Annual International Conference of the IEEE Engineering in Medicine and Biology Society, Minneapolis, Minnesota, September 2-6, 2009, pp 6115-6118. Anderson D, Luke R, Keller J & Skubic M, “Extension of a Soft-Computing Framework for Activity Analysis from Linguistic Summarizations of Video,” Proceedings, IEEE International Congress on Fuzzy Systems (FUZZ-IEEE), WCCI, Hong Kong, China, June 1-6, 2008, pp 1404-1410, Best Student Paper Award. Anderson D, Luke R, Skubic M, Keller JM, Rantz M & Aud M, “Evaluation of a Video Based Fall Recognition System for Elders Using Voxel Space,” Proceedings, International Conference of International Society for Gerontechnology, Pisa, Italy, June 4-7 2008, pp 77-82. Luke RH, Anderson D, Keller JM & Skubic M, “Human Segmentation from Video in Indoor Environments Using Fused Color and Texture Features,” Technical Report, ECE Dept, University of Missouri, Columbia, MO, 2008.